There’s a new robot in town. His name is Sawyer. He has one arm and a gripper, a reach of 1 meter, and he weighs 42 pounds. 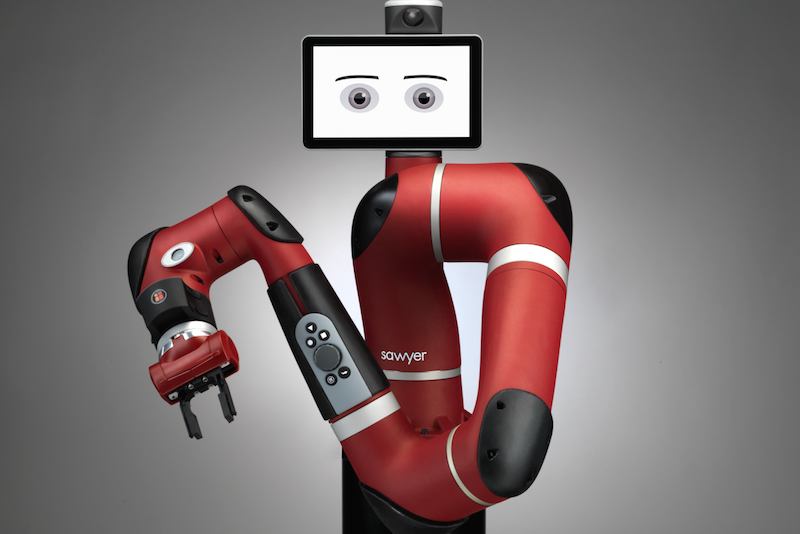 He’s designed to work in manufacturing settings, doing things like testing circuit boards and other precise tasks. He’s apparently more agile and compact than his brother, Baxter, who was also designed to work in factories, but is larger and has two arms. Both robots are made by Rethink Robotics, the Boston company founded by roboticist and artificial intelligence expert Rodney Brooks. The idea with the new machine is to tackle other classes of automation tasks—things that couldn’t be done before with standard industrial robots. To do that, the new robot has high-resolution force sensors at each joint, which enable it to feel its way around its workspace as parts and other things move around. It also has an embedded vision system consisting of a wide-view camera in its head and a wrist camera (made by Cognex) for high precision. Sawyer will start to be rolled out this summer, with a more general release planned for later in the year, the company says. The base price is $29,000, and Rethink is targeting customers in North America, Europe, China, and Japan. The robot is currently being tested by several big manufacturing companies in those regions, the company says. I’ll update this post after talking to the company.